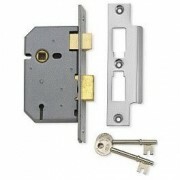 This section covers various means of locking or latching a door. 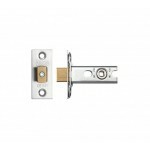 There are locks and latches for internal doors, bathroom doors, external doors and gates. Brands within this section include Chubb, Union, StaLock, Arrone Bathroom Locks, Carlisle Brass, Neulock and ERA. 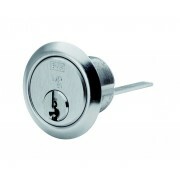 Union 1448 Rim Lock is fitted to the face of a door,and is reversible. The black body has a brass follower and bolts. Measures 140mm x 74mm. 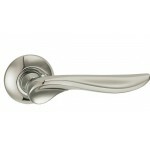 ..
Union 1116 Rim Dead Lock is fitted to the face of a door for an authentic period touch. 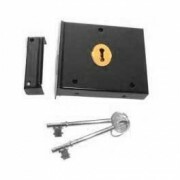 Black steel body is fitted with brass finish follower and brass bolt. Comes with 2 keys. 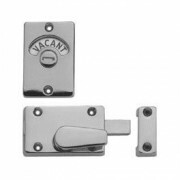 Dimensions108mm x 92mm ..
Union 2277 Mortice Sashlock 3 Lever Supplied with 2 Keys Satin Chrome Forend & Strike Sizes 51mm 63mm 76mm 102mm ..
UNION VACANT/ENGAGED INDICATOR BOLT SATIN CHROMED Features Emergency Release and indicator ..
Universal Rim Cylinder to suit nightlatches Available in two finishes Satin Chrome or Polished Brass ..